This is perhaps the clearest view of the extended Royal Hotel, which is almost in the centre of the picture, before it was partially destroyed by fire at Eastertime of 1929 - the year after the guide that this image is scanned from was published. The photograph was taken from the top of Cat Tor. 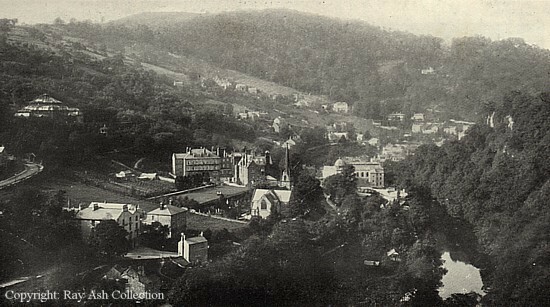 Matlock Bath : New Bath Hotel shows a photograph taken after the fire. The buildings bottom right are Bath Terrace Hotel, which became part of the New Bath, and Portland House at the bottom of Clifton Road. Holy Trinity Church and both the Old and New Pavilions are the other large buildings. The old Royal Pavilion, which had been re-named the Palais Royal in 1923, is top left, surrounded by woodland. Beside the river, on the left bank, are the grounds of the Derwent Gardens and part of the Switchback Railway can be seen. Image from Ward Lock & Co's "Matlock, Dovedale, Bakewell and South Derbyshire", Illustrated Guide Books of England and Wales (1928). The photographs in the book were unlikely to have been taken specifically for the guide and were also not necessarily of the same date the book was published.